VAT (value-added tax) is often called a universal one as it is very frequently paid by physical and legal persons. It is obligatory in most countries including the Czech Republic to pay VAT. There are certain cases when companies and sole traders must register as VAT payers and we will describe them here. modifying company that used to be a VAT payer. exceeding 1 million korunas in money turnover. 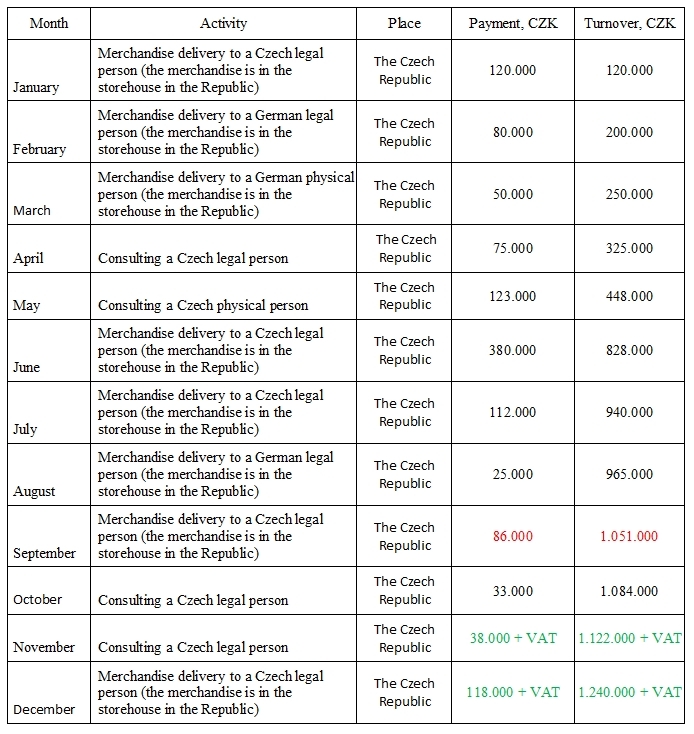 According to the VAT regulation, Czech companies and individual entrepreneurs must be registered as VAT payers when the money turnover exceeds 1 million korunas for 12 month in a row (in this case a calendar year is not taken into account, and the period can be counted from, for instance, April 2017 – March 2018). What is implied by a turnover VAT is charged from? Ratable turnover includes all the income of an enterprise or a sole proprietorship gained for providing services or merchandise delivery, according to the VAT regulation, at any Czech region. The start date is the day when the delivery of merchandise was performed and not the day when the payment was received. Therefore, the ratable turnover includes also providing a service/merchandise delivery a client paid after the mentioned time or did not paid for at all. If a company/sole proprietorship deals with used merchandise, the turnover includes not only markup but also the whole price of the merchandise. What ratable turnover does not include? income gained, according to the VAT regulation, outside the Czech Republic. If a company/sole proprietorship provides services to foreign legal/physical persons who do not have a representation (an office) in the Czech Republic (either they pay VAT or not), the Czech Republic is not considered as a country where the service is received (it is called “reversed charge”) and the price of such a service is not ratable. For instance, a Czech entrepreneur provides an advertising service to a German company that does not have an office in the Republic. In such a case, according to the VAT regulation, VAT policy will be valid for Germany. Mentioned income is not associated with the ratable million korunas turnover. In the mentioned case a company/individual entrepreneur must register as a European VAT payer (Identifikovaná osoba) who takes certain legal responsibilities. When it is necessary to register as a VAT payer? If keeping the financial report an accountant of a company/individual entrepreneur noticed that the income for 12 months in a row exceeded 1 million korunas, such a person becomes a VAT-payer since the 1st day of the month when the mentioned sum was exceeded. He/she should register as a VAT payer during 15 days after the last day of the month when the turnover is exceeded. It is obvious from the table that in September the income of this legal person exceeded 1 million korunas. Thus, till 15th of October the legal person must apply for a VAT payer registration. This company sells merchandise without VAT charge in October. It becomes a VAT payer since the 1st of November. Therefore, VAT is added to the prices for services in November. The first VAT declaration this theoretical company submits for November (till 25th of December). What rights and obligations a VAT payer bears? to pay VAT to the till or special bank account to the corresponding department of the Tax institution. The payment should be conducted not after the 25th day since the end of the taxable period. Reporting period in the first two years of conducting a VAT payer activity is a month. To change the reporting system to the quarter one, a company/sole trader can only starting from the 3rd year if certain conditions are met (a turnover for the previous calendar year must not exceed 10 millions korunas, a person must not be included to the list of unreliable tax payers and so on.). It is necessary to inform the Tax Institution about the change in the reporting system till the end of January of a current year. What are the benefits of being registered as a VAT payer? a company/sole trader can purchase merchandise in foreign countries without VAT. If any further questions arise, do not hesitate to ask. Our qualified accountants will be glad to help you.